This is an interactive PowerPoint designed as a review of multiple language standards. It can be used as a review before end of year testing or just for grammar practice. 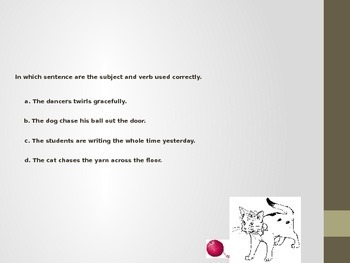 It includes verb tenses, idioms, subject/verb agreement, capitalization, comparative adjectives, combining sentences, commas in addresses, apostrophes, and dialogue. The slides can be easily duplicated to create more practice for each skill as needed for your class.